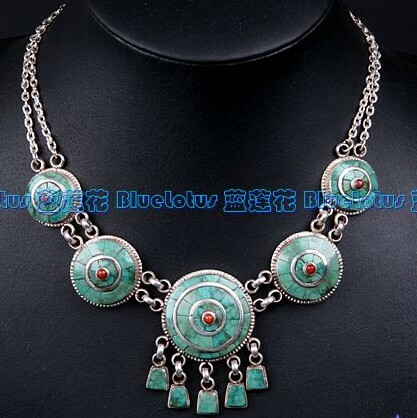 Welcome to Tibetartwork.com. 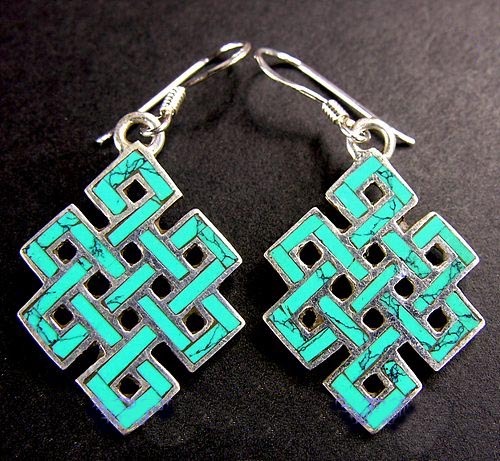 We introduce tibetan & buddhist symbols and jewelries to the worldwide people. 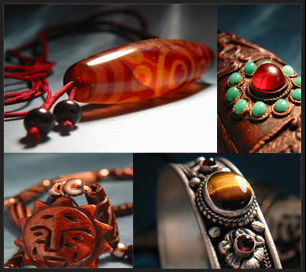 We offer Nepalese and Tibetan artisan handmade ethnic Tibetan beads and jewelry from Nepal & Tibet. Tibetan Prayer Wheel: A prayer wheel with a wooden handle is leaning upright in this old engraving.Without the little swinging counter weight, the device is referred to as a prayer mill and works somewhat like a pepper mill. In places with a Tibetan Buddhist tradition, prayer wheels ( Tib. cho-khor) appear as a series of vertical drums that turn on their axes set in a large installation around the circumference of a stupa or a shrine. When a practitioner walks around the installation in a clockwise direction and rubs each one with the right hand as he or she passes, they are sent rotating. In the interiors, thousands of mantras are thought to be activated as the drums on which they are inscribed rotate. 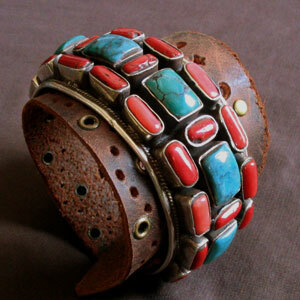 Read more about tibetan prayer wheel. 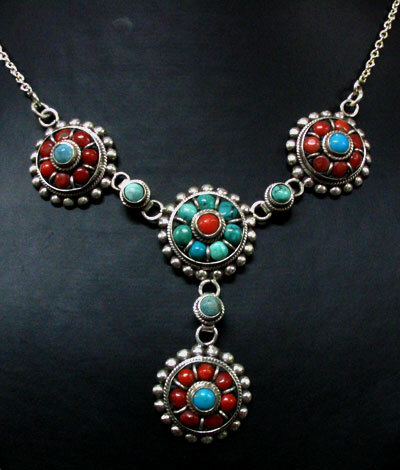 Because they are worn as jewelry, Gaus are made of metal and are often ornamented with semi-precious stones, but they vary enormously in style according to the taste of the designer. 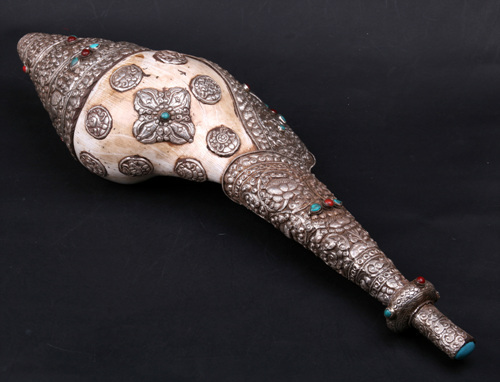 The one shown here is a contemporary clamshell-hinged Gau from Nepal, decorated with a double dorje design and a small piece of red coral. It is made with a ring at each end. 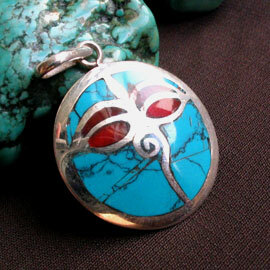 One of the rings is the hinge, the other is the box's opening catch, so this Gau can be strung sideways or hung as a pendant on a cord, either alone or among other beads and charms. 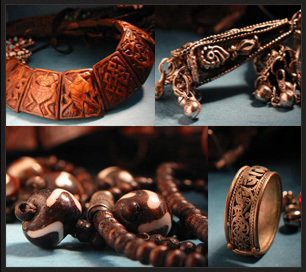 Since the late 20th century, when trade with central Asia increased, Nepalese Gaus have became increasingly popular with eclectic practitioners of magic in Europe and the Americas, especially those who make their own talismans or prepare amulets for clients. Although perhaps not properly respectful of the Gau's original spiritual function as a holder for Buddhist prayers, these Western mages and root workers -- and i admit that i am among them! 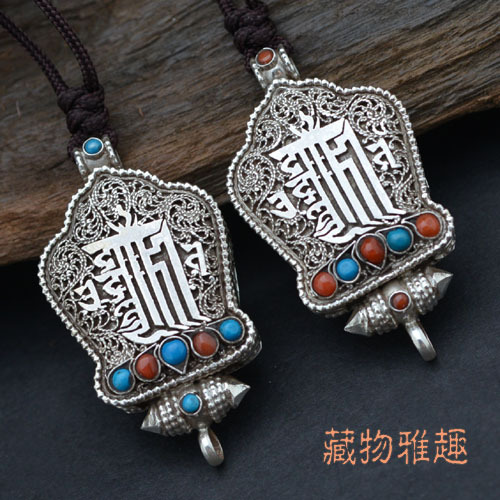 -- find it intriguing that, when empty, the beautiful jewelry-like Gau boxes of Nepal are just the right size to hold a King Solomon pentacle seal and a variety of plant or mineral materials. 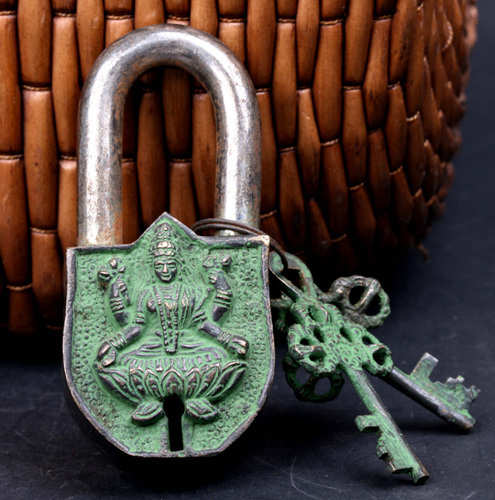 Best of all, because Gaus are not flat like European or American lockets, their interiors are voluminous enough to hold the assorted symbolic objects that comprise a typical hoodoo "bottle spell," albeit on a miniature scale. Thus we find modern root-workers and pagan witches using Gaus as holders for amulets designed to provide magical protection or to draw love or money or increase the wearer's gambling luck. Buddha Eyes: On virtually every stupa (Buddhist shrine) in Nepal, there are giant pairs of eyes staring out from the four sides of the main tower. These are Buddha Eyes (also known as Wisdom Eyes), and they look out in the four directions to symbolize the omniscience (all-seeing) of a Buddha. The Buddha eyes are so prevalent throughout the country that they have become a symbol of Nepal itself. 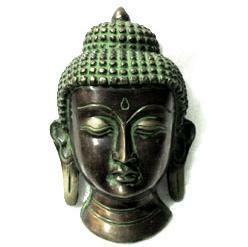 Between the Buddha's eyes where the nose would be is a curly symbol that looks like question mark. 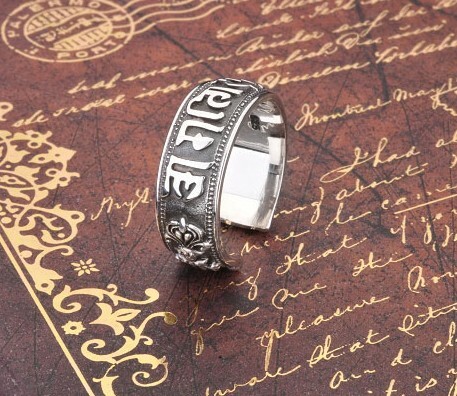 This is the Nepali character for the number 1, which symbolizes unity of all the things as well as the one way to reach enlightenment - through the Buddha's teachings. Above this is a third eye, symbolizing the all-seeing wisdom of the Buddha. 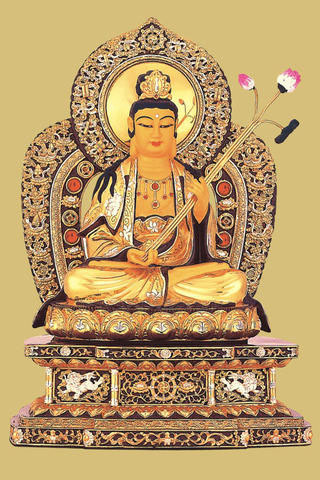 Read more about the tibetan buddha wisdom eyes.